Well, those two little dresses didn't get finished due to this and that and too much procrastination. Their mom found the girls a couple of cute dresses to wear instead, and I can now spend the rest of the year working on the green dresses for next year, sizing them up one to allow for growth. I'm pondering whether to re-pleat the pleats on the smocked dress since I pulled it up to the incorrect, too-small size. Christmas went well enough. A friend (my ex, actually) came out from Philly and brought his new companion dog. The cats weren't happy, but they spent the day on the third floor and recovered quickly after Moonlight left. She's a Pit Bull/Lab mix (mostly) and just the sweetest doggo ever. She'd been a stray on the streets of Philly and was rescued. R was fostering her until she could go to her furever home (she needed some medical care), but just couldn't give her up. Can't say I blame him. 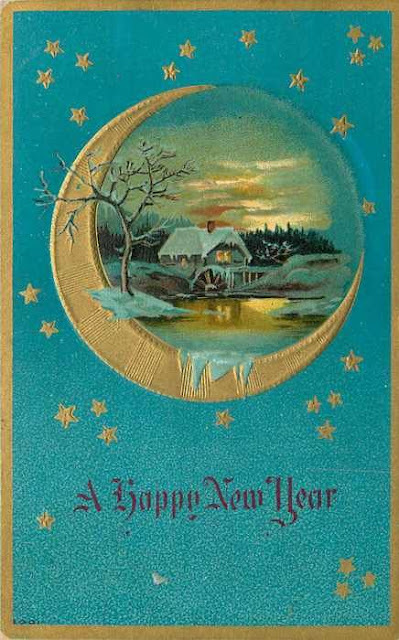 Tomorrow I'll probably make a list of all the Things I Want To Complete for the coming year. I don't call it a resolution. It's just a game plan, subject to amendments and editing as needed. There are a few things that are solid though: put the elastic in my ironing station cover, re-cover my tiny ironing board, as I've found that I actually do need that pointy bit from time to time when ironing pleated skirts and sleeves and such, and installing two more drawers on the station. Getting things sorted and weeded out is an ongoing project. I have a hard time letting go of anything that might be useful, but a harder time keeping those things in a manner where I can actually find them if they ARE needed. I suspect there are lots of multiples of basic sewing supplies on the third floor. Time to gather them up and use them. The Glittering Gentleman's Nightcap, a project I started a few years ago. I've also recently discovered that my youngest sister-in-law is going to need a Christening Gown for an Impending Stranger. My favorite sort of sewing. I'm already planning that particular confection, and ordered fabric for it Saturday! Have you ever had one of those projects that you were really excited about, but thing just kept stomping all over your enthusiasm? Of course you have, if you're a normal person. I'm still working on christmas dresses for my great-grand-neices. I love the patterns. I love the fabric. The beadwork will be fun to work on. IF I can get the wretched bodice on the larger one properly! bodice, pull the pleats to fit and carefully, carefully go over the entire length of the seam twice to make sure nobody has wriggled to the right side again. Stitch the seam... turn it over, and it looks pretty good. I take the garment into the other room and sit down, slide the seam under my magnifying light and discover that somehow, SOMEHOW, a few threads have escaped to the right side. I made the seam bigger; screw ripping all those stitches out again. The next step is to fold the bodice lining back over the skirt and bodice front bits, making a sort of fabric sandwich. It didn't look quite right, but I stitched it anyway. I pulled out the pins and shook the garment out....yeah, it looked okay, so I did the other side of the bodice. This is when I realized that the previous sandwich was more of a bread/bread/filling than the proper bread/filling/bread. You guessed it. 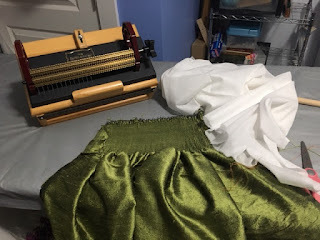 I am going to have to take those stitches out again and redo the skirt-to-bodice seam, this time actually stitching the pieces wrong sides together the right way around. But first, I'm going to have a SoCo and cola and watch an episode of Midsomer Murders. Nothing like a little murder and illicit doin's in the quaint villages of South Oxfordshire to repair a fractious sewing session! This afternoon I threaded up the pleater so I could get going on Beaded Garland. I pressed a layer of German Interfacing to the wrong side of the skirt top. Silk Dupioni is a bit of a bear to pleat because it wriggles and it frays. The very lightweight cotton batiste that this interfacing is made from adds just enough stability to the fabric to keep it from wriggling around as it is going through the pleater. It also helps to plump up the pleats a bit. I'm fairly sure that this is one of the best pleating jobs I have ever done! I used a winning combination- my Super Amanda pleater, German interfacing and a slow hand on the pleating wheel. The fabric came right off the needles with none of the usual tugging. I can't tell you how impressed I am with myself! Next up are the blocks for the tucked dress bodice and tucked pinafore bodice for the younger sister's dress. I didn't notice that the pattern alterations started at a size 8 until I glued the tucking guides together. I guess I'll wing the size 4! Speaking of patterns, I'm using a pdf download which means lots of pages to stick together. I used to use tape, and I loathed this process. I switched to Scotch brand Scrapbooking glue. The bottle has two applicators: one is a dabber pad and the other is a fine-point nozzle. I've used both now and really like both how the glue goes on and how well it sticks. 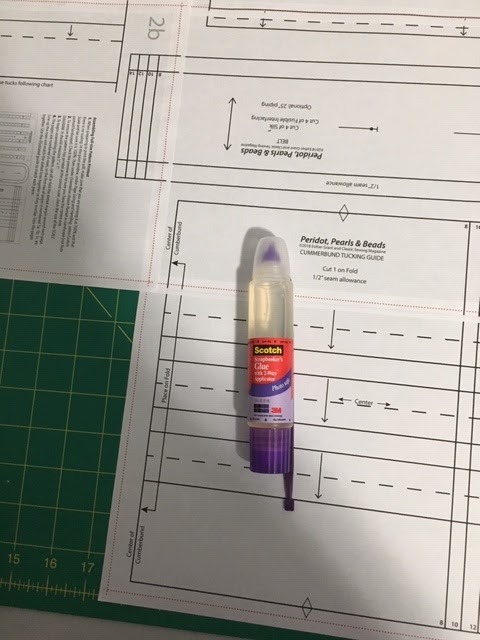 I had a bit of time to make sure the paper was aligned correctly before the glue set. Now, time for a dinner break, and then back at it. Time's closing in on me, but I wouldn't be me if I wasn't being loomed over by a deadline. I got sucked down the hole of Pinterest, as one does when there is a sewing deadline looming, and ran across a post on making an ironing station using an Ikea Kallax 2x4 unit and a piece of hardboard. One horrible trip to Ikea and an hour of work by the hubby and I had the base unit done. It took a couple of hours to cover the ironing surface. I used a 3x6 piece of 1/4" pressboard, two layers of cotton quilt batting, a layer of Insul-Brite and a final cover of Iron Quick fabric. What an amazing pressing surface this makes! 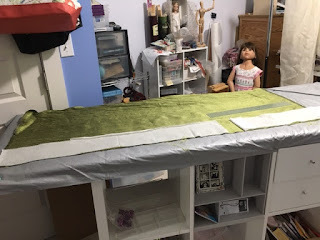 I can press a 54" width of fabric with room to spare on either side! the organdy for the pinafore. Because I have so few examples of my stitching I thought it would be a good idea to volunteer to make holiday dresses for my great-grand-neices. I had one in mind, but when I sent the link to Classic Sewing Magazine to their mom, both girls decided they liked different dresses, and because I'm a good Auntie, I said "suuuure". Photos of the dresses can be found here on the magazine's website. [scroll down about 3/4 of the way). Aria chose Glitter Garland (p 15-16) and Emma was partial to Peridot, Peals and Beads (p 13-14). 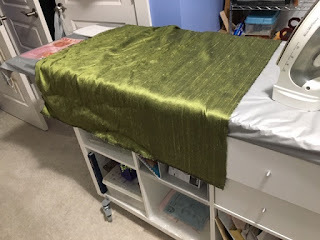 Here I am now, with $200 worth of silk dupioni, $30 worth of lace yardage, a pile of notions and absolutely no motivation to go upstairs and sew. On the plus side, the hubby switched the lightbulbs in the sewing room fixtures and the rooms are super bright at night, now! My original plan was to have the dresses finished and mailed off so they could wear them for Thanksgiving as well as Christmas. I may have to re-think that unless I stitch fast. I still can't believe that Thanksgiving is next week. The 2018 SAGA Convention is fast approaching. On Monday, I'll be heading to Winston-Salem, North Carolina for a week of stitching and conversation with a whole crew of other women. Of course, Florence is also barreling down on the North Carolina coast, so we're all waiting to see how she veers before throwing the suitcases into the car. The venue is 60 miles or so inland so storm surge won't be much of an issue, but this hurricane is supposed to be "really wet" which makes heavy rains and winds an issue to watch. Hopefully, the storm will have hit and weakened by the time we need to head south. Most of my week will be spent with Claudia Newton. My first day is a small hardanger ornament. I like the idea of small, and I like that the project is something I should be able to finish. On Thursday I migrate to Australian teacher Judith Adams for a class on designing smocking plates. Earlier in the year, I'd started trying to design a few graphs that had cables tapering into large hearts. It looks easy enough on similar plates. You just need some baby waves for the tops and then some trellises to make the lower part of the hearts. My math/engineering/design skills were NOT up to getting the bottom points of the hearts hearts to meet up properly with the center or the upper points. I finally gave up and used a- transcription? interpretation? - of a dress I'd seen on Pinterest (as one does). It turned out well, but I'd like to be able to figure out how to put these elements together on my own. I'll be with Miss Claudia for the remainder of the convention. I'm repeating a class on dainty edges. She teaches a gorgeous mitered hem suitable for delicate hankies or hand towels, and while I finally got the gist of it in the first go-round I would like a refresher. 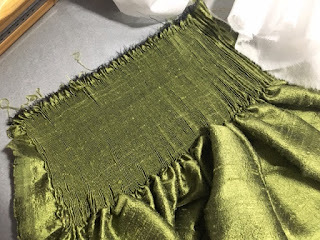 There will also be instruction on a shell edge and applying delicate lace or tatted edgings to fabric, discussion of the proper threads to use and when to use color. Photos of all these projects and more can be seen at www.smocking.org under "convention class descriptions". It will probably only be available for another week, though. I'll see if I can post photos from the brochure here in my blog after that. It bugs me when I read a blog and get links to photos that have disappeared, so I'll try to avoid doing that to you, my readers. In the interim between now and taking off I'll be doing the usual- frantically catching up on laundry, sorting out the tools and supplies I need to take along with me, watching the Weather Channel often, and finishing up a few Wee-Care projects for donation.